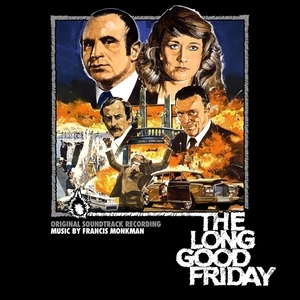 The 416th Soundtrack of the Week is the score for one of my favorite movies, The Long Good Friday, music by Francis Monkman. This is one of the greatest gangster movies of all time, and Monkman's urgent, propulsive score, which successfully fuses several styles of music, is one of the ingredients that make up such an arresting viewing experience. For "Overture" Monkman uses a drivingly rhythmic keyboard line to create momentum and tension at first but then opens up the sonic landscape, creating spaces which can be filled with other moods. Some of this might remind you of Goblin's best work. Most of the cues make use of these two themes, though there is the rather wonderful reggae song "Talking to the Police" which features the vocal talents of Bob Hoskins! There's also a guitar performance of Bach's "Sarabande in B Minor" and a flamenco piece. This is amazing music and a joy to have on CD. This two-disc edition has remastered stereo tracks with snippets of dialogue from the film mixed in on one CD and the original mono recordings, just music, no talking, on the other.